Your new Dashboard is here with a bold new look, showing key metrics in a visually engaging & useful way. A new campaign option let's you decide when results get pushed to your email, and is fully responsive to use on your mobile device. 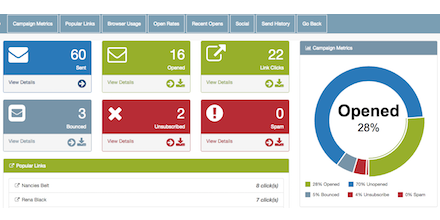 It's in real time so you can see results as subscribers engage with you. Like the most popular links in the campaign and a list of subscribers who recently opened the email or clicked on a link. And which device is the most popular with your subscribers, is it the iPhone or Firefox ? The dashboard is now active on your account, look for the new dashboard icon and try it now! National Technology Park, Plassey V94 RT7C, Ireland.